Galerie Michael Haas was founded in Berlin in 1976 by Michael Haas. 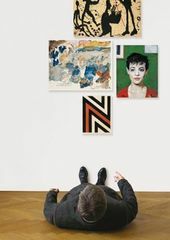 The gallery focuses upon classical modern art, German and international art after 1945, and contemporary art. For over 30 years internationally renowned artists have been presented in solo and group exhibitions. Including amongst others; Georg Baselitz, Jean-Michel Basquiat, Günther Brus, Giorgio de Chirico, Otto Dix, Jean Dubuffet, Jean Fautier, Hans Hofmann, Ernst-Ludwig Kirchner, Per Kirkeby, Mimmo Paladino, A.R.Penck, Arnulf Rainer, Louis Soutter and Gerhard Richter. Art dealing and the support of younger artistic positions present two further focal points. Both in dealing with the works of established artists (e.g. Chagall, Hodler, Klee, Léger, Nolde, Picasso, Richter, Vallotton, Warhol) and the presentation of much younger art, the emphasis is upon the fields of painting, sculpture, and works on paper. Representing contemporary art are, amongst others; Nicole Bianchet, Marianna Gartner, Dirk Lange, Stefan Mannel and Réne Wirths. Galerie Michael Haas regularly takes part in international art fairs such as Art Basel and Art Cologne.